Wikimedia Commons has media related to 2011 . 2011 ( MMXI ) was a common year starting on Saturday of the Gregorian calendar , the 2011th year of the Common Era (CE) and Anno Domini (AD) designations, the 11th year of the 3rd millennium , the 11th year of the 21st century , and the 2nd year of the 2010s decade. The International Year of Chemistry 2011 was a year-long commemorative event for the achievements of chemistry and its contributions to humankind. The recognition for chemistry was made official by the United Nations in December 2008. Events for the year were coordinated by IUPAC, the International Union of Pure and Applied Chemistry, and by UNESCO, the United Nations Educational, Scientific, and Cultural Organization. The United Nations General Assembly declared the year 2011 as International Year for People of African Descent. That year also marked the 10th anniversary of the World Conference Against Racism, which approved a resolution stating that slavery along with the colonization that sustained it were crimes against humanity. The 2011 Alexandria bombing was an attack on Coptic Christians in Alexandria, Egypt, on Saturday, 1 January 2011. 23 people died and another 97 were injured as a result of the attack, which occurred as Christian worshipers were leaving a New Year service. The attack was the deadliest act of violence against Egypt's Coptic Christians in a decade, since the Kosheh massacre in 2000 left 20 Copts dead. The target of the bombing was the Saints Church, a Coptic church located across the street from the Masjid Sharq El-Madina mosque. February 22 – March 14 – Uncertainty over Libyan oil output causes crude oil prices to rise 20% over a two-week period following the Arab Spring,  causing the 2011 energy crisis. February 11 is the 42nd day of the year in the Gregorian calendar. 323 days remain until the end of the year. The President of the Arab Republic of Egypt is the head of state of Egypt. Under the various iterations of the Constitution of Egypt, the president is also the Supreme Commander of the Armed Forces and head of the executive branch of the Egyptian government. The current president is Abdel Fattah el-Sisi, in office since 8 June 2014. 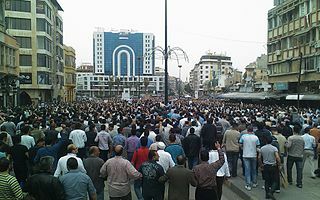 The civil uprising phase of the Syrian Civil War, or as it was sometimes called by the media the Syrian Revolution of Dignity was an early stage of protests – with subsequent violent reaction by the Syrian Arab Republic – lasting from March to 28 July 2011. The uprising, initially demanding democratic reforms, evolved from initially minor protests, beginning as early as January 2011 and transformed into massive protests in March. 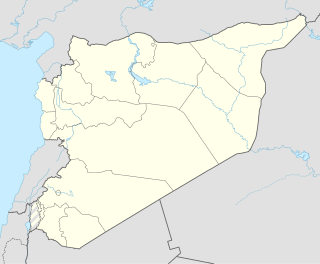 Daraa is a city in southwestern Syria, located about 13 kilometres (8.1 mi) north of the border with Jordan. It is the capital of Daraa Governorate, historically part of the ancient Hauran region. The city is located about 90 kilometres (56 mi) south of Damascus on the Damascus–Amman highway, and is used as a stopping station for travelers. Nearby localities include Umm al-Mayazen and Nasib to the southeast, al-Naimeh to the east, Ataman to the north, al-Yadudah to the northwest and Ramtha, Jordan to the southwest. April 25 – 28 – The 2011 Super Outbreak forms in the Southern, Midwest and Eastern United States with a tornado count of 362; killing 324 and injuring over 2,200. April 29 – An estimated two billion people  watch the wedding of Prince William, Duke of Cambridge and Catherine Middleton at Westminster Abbey in London. The foreign relations of the Libyan Arab Jamahiriya (1969–2011) underwent much fluctuation and change. They were marked by severe tension with the West and by other national policies in the Middle East and Africa, including the Libyan government's financial and military support for numerous paramilitary and rebel groups. Al-Saadi Muammar Gaddafi, is the third son of former Libyan leader Muammar Gaddafi. He is a Libyan former association football player. In 2011, he was the commander of Libya's Special Forces and was involved in the Libyan Civil War. An Interpol notice was issued against him in 2011. On 5 March 2014, he was arrested in Niger and extradited to Libya, where he faced murder charges, of which he was cleared in 2018. In August 2015, video surfaced allegedly showing Gaddafi being tortured. Saif al-Islam Gaddafi is a Libyan political figure. He is the second son of the former Libyan leader Muammar Gaddafi and his second wife Safia Farkash. Gaddafi was awarded a PhD from the London School of Economics. Baghdadi Ali Mahmudi was Secretary of the General People's Committee of Libya from 5 March 2006 to as late as 1 September 2011, when he acknowledged the collapse of the GPCO and the ascendance of the National Transitional Council as a result of the Libyan Civil War. He has a medical degree, specialising in obstetrics and gynecology, and had served as Deputy Prime Minister to Prime Minister Shukri Ghanem since 2003 at the time he was appointed to replace him. He was a part of Gaddafi's inner circle at least prior to his escape in mid-2011. He was arrested in Tunisia for illegal border entry and jailed for six months, although this was later overruled on appeal, however a Tunisian court decided to extradite Mahmoudi to Libya under a request from Libya's Transitional Council. Abdullah (al) Senussi is a Libyan national who was the intelligence chief and brother-in-law of Colonel Muammar Gaddafi. He was married to Gaddafi's sister-in-law. The international reactions to the Libyan Civil War were the responses to the series of protests and military confrontations occurring in Libya against the government of Libya and its de facto head of state Muammar Gaddafi. The National Transitional Council of Libya, sometimes known as the Transitional National Council, was the de facto government of Libya for a period during and after the Libyan Civil War, in which rebel forces overthrew the Libyan Arab Jamahiriya of Muammar Gaddafi. The NTC governed Libya for a period of ten months after the end of the war, holding elections to a General National Congress on 7 July 2012, and handing power to the newly elected assembly on 8 August. 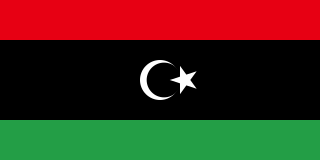 The foreign relations of Libya were largely reset at the end of the Libyan Civil War, with the overthrow of Muammar Gaddafi and the ongoing Second Libyan Civil War. The current Minister of Foreign Affairs in the internationally recognized executive government known as the Government of National Accord (GNA) is Mohamed Taha Siala. Although many foreign embassies in Tripoli closed down in 2014 due to the fighting, by the end of 2017 thirty diplomatic missions were reopened in the Libyan capital. Gaddafi loyalism refers to sympathetic sentiment towards the overthrown government of Muammar Gaddafi, who was killed in October 2011. It has been responsible for some of the ongoing violence in Libya, though the degree of its involvement has been disputed in a number of instances. ↑ "United Nations Observances". United Nations. Retrieved 5 July 2012. ↑ "Estonia becomes 17th member of the euro zone 31/12/2010 BBC News". BBC News. 2010-12-31. Retrieved 2012-05-06. ↑ Gardner, Frank (2011-12-17). "Tunisia one year on: Where the Arab Spring started". BBC News. Retrieved 2012-01-15. ↑ "Vegetable seller who inspired Arab Spring honoured". CBC News. Associated Press. 2011-12-17. Retrieved 2012-01-15. ↑ Wyre Davies (15 December 2010). "BBC News – Tunisia: President Zine al-Abidine Ali forced out". BBC News. Archived from the original on January 15, 2011. Retrieved 2011-01-14. ↑ "Uprising in Tunisia: People Power topples Ben Ali regime". Indybay. 16 January 2011. Retrieved 2011-01-26. ↑ Amie Ferris-Rotman (24 January 2011). "Suicide bomber kills 31 at Russia's biggest airport". Reuters . Retrieved 2011-06-21. ↑ Число жертв теракта в Домодедово возросло до 37 (in Russian). RIA Novosti. 24 February 2011. Retrieved 24 February 2011. ↑ Steve Rosenberg (24 January 2011). "Moscow bombing: Carnage at Russia's Domodedovo airport". BBC News. Archived from the original on January 25, 2011. Retrieved 24 January 2011. ↑ "Hosni Mubarak resigns as president". Al Jazeera. 11 February 2011. Archived from the original on February 11, 2011. Retrieved 11 February 2011. ↑ Dicolo, Jerry A.; Baskin, Brian (February 22, 2011). "The Stealth Return of $100 Oil". The Wall Street Journal . Archived from the original on February 24, 2011. Retrieved March 12, 2011. ↑ "Japan earthquake live blog: Death toll rises amid widespread destruction". CNN blog. Time Warner. 12 March 2011. Archived from the original on March 16, 2011. Retrieved 12 March 2011. ↑ Staff writer (15 March 2011). "Bahrain King Declares State of Emergency after Protests". BBC News. Archived from the original on 5 April 2011. Retrieved 15 April 2011. ↑ Staff writer (15 March 2011). "Two Killed in Bahrain Violence Despite Martial Law". BBC News. Archived from the original on 5 April 2011. Retrieved 15 April 2011. ↑ "Mid-East unrest: Syrian protests in Damascus and Aleppo". BBC News. 2011-03-15. Retrieved 2017-05-10. ↑ "Fresh violence hits Syrian town". Al Jazeera. 2011-04-30. Retrieved 2017-05-10. ↑ "libyafeb17.com". libyafeb17.com. Retrieved 2012-05-06. ↑ "World leaders launch military action in Libya". MSNBC.com. 19 March 2011. Archived from the original on May 1, 2011. Retrieved 19 March 2011. ↑ Kirkpatrick, David D.; Bumiller, Elisabeth (19 March 2011). "France Sends Military Flights Over Libya". The New York Times . Archived from the original on March 26, 2011. Retrieved 19 March 2011. ↑ "Gbagbo, wife in Ouattara's custody in I.Coast: UN". Reuters. 11 April 2011. Archived from the original on April 26, 2011. Retrieved 11 April 2011. ↑ Grimley, Naomi (29 April 2011). "Royal wedding: The world watches William and Kate". BBC News. Retrieved 16 May 2011. ↑ Goldman, Adam; Brummitt, Chris (May 2, 2011). 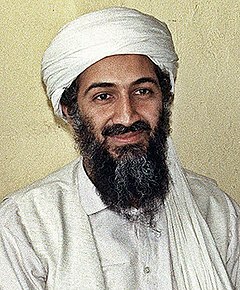 "Bin Laden's demise: Long pursuit, burst of gunfire". Associated Press. Archived from the original on May 13, 2011. Retrieved May 16, 2011. ↑ "Portugal's 78bn euro bail-out is formally approved". BBC Business News. 16 May 2011. Retrieved 13 November 2011. ↑ David Learmount (26 May 2011). "European proceedures (sic) cope with new ash cloud". Flightglobal. Archived from the original on July 3, 2015. Retrieved September 28, 2015. ↑ Interpol. "Interpol: Wanted MLADIC, Ratko". Interpol.int. Archived from the original on 2009-07-04. Retrieved 2011-05-26. ↑ Wardrop, Murray (26 May 2011). "Ratko Mladic: war crimes fugitive 'arrested in Serbia'". The Daily Telegraph . London. Retrieved 26 May 2011. ↑ McNeil Jr, Donald G. (2011-06-27). "Rinderpest, a Centuries-Old Animal Disease, Is Eradicated". The New York Times . ↑ "South Sudan: New nation". BBC . 24 July 2013. Retrieved 23 October 2013. ↑ "Neptune Completes First Orbit Since Its Discovery in 1846". Space.com. ↑ Worsnip, Patrick; Davies, Megan (14 July 2011). "South Sudan admitted to U.N. as 193rd member". Reuters. Retrieved 29 November 2015. ↑ "The Associated Press: Serbia arrests last Balkan war crimes fugitive". Google.com. Archived from the original on July 20, 2011. Retrieved 2011-07-21. ↑ "Somalia on verge of famine". CBC News. 18 July 2011. Archived from the original on July 20, 2011. Retrieved 18 July 2011. ↑ "Atlantis Completes Final Space Shuttle Program Landing at 5:57 a.m. EDT". NASA. 21 July 2011. Archived from the original on July 26, 2011. Retrieved 21 July 2011. ↑ "Norway massacre: 'We could hear the gunshots getting closer'". BBC. Retrieved 13 October 2018. ↑ "Thailand cleans up; Areas remain flooded". Time. Associated Press. December 2, 2011. Archived from the original on January 8, 2012. ↑ "Death toll of Thai floods rises to 790". The Jakarta Post. 2011-12-30. Archived from the original on February 17, 2012. Retrieved 2012-05-06. ↑ South East Asia correspondent, wires. "ABC News Australia" . Retrieved 2012-05-06. ↑ Detrixhe, John (August 6, 2011). "U.S. Loses AAA Credit Rating as S&P Slams Debt Levels, Political Process". Bloomberg. ↑ Bremer, Catherine; Dmitracova, Olesya (8 August 2011). "Analysis: France, Britain AAA-ratings under scrutiny". Paris/London. Reuters. Retrieved 10 August 2011. ↑ "NASA launches mission to Jupiter". RTÉ . 5 August 2011. Retrieved 5 August 2011. ↑ "Wednesday, August 31, 2011 – 09:31 GMT+3 – Libya". Blogs.aljazeera.net. 2011-08-31. Retrieved 2012-05-06. ↑ Staff (29 August 2011). "Gadhafi Family Members in Algeria, Ambassador Says". CNN. Retrieved 29 August 2011. ↑ Staff (23 August 2011). "Libya Unrest: Rebels Overrun Gadhafi Tripoli Compound". BBC News. Retrieved 24 August 2011. ↑ "India-Bangladesh sign pact on border demarcation". Ibnlive.in.com. Retrieved 2012-05-06. ↑ Hassan Lali (2011-09-12). "Kenya fire: Nairobi pipeline blaze 'kills at least 75'". BBC News. Retrieved 2012-05-06. ↑ "Occupy Wall Street | September 17th". Adbusters.org. Archived from the original on November 18, 2011. Retrieved October 6, 2011. ↑ Shenker, Jack; Gabbatt, Adam (25 October 2011). "Tahrir Square protesters send message of solidarity to Occupy Wall Street". The Guardian. London. Retrieved 15 November 2011. ↑ "احتجاجات بـ82 دولة للمطالبة بالعدالة". AlJazeera.net. Retrieved January 3, 2012. ↑ Joanna Walters (8 October 2011). "Occupy America: protests against Wall Street and inequality hit 70 cities". The Guardian. London. Retrieved October 14, 2011. ↑ Derek Thompson (Oct 15, 2011). "Occupy the World: The '99 Percent' Movement Goes Global". The Atlantic. Retrieved October 15, 2011. ↑ Karla Adam (October 15, 2011). "Occupy Wall Street protests go global". The Washington Post. Retrieved November 8, 2011. ↑ Karla Adam (October 16, 2011). "Occupy Wall Street protests continue worldwide". The Washington Post. ↑ Joanna Walters in Seattle (8 October 2011). "Occupy America: protests against Wall Street and inequality hit 70 cities | World news". The Observer. UK. Retrieved October 13, 2011. ↑ "UN Appeals For $357 Million To Help Pakistan Flood Victims ''Radio Free Europe''". Rferl.org. 2011-09-19. Retrieved 2012-05-06. ↑ "Floods claim 207 lives in Cambodia". Wfp.org. Retrieved 2012-05-06. ↑ "After 5 years in captivity, Shalit is back home - CNN.com". CNN. 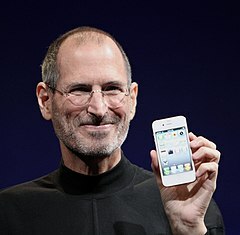 October 19, 2011. ↑ "Gilad Shalit release: Palestinian prisoner exchange getting under way". The Guardian. London. October 18, 2011. ↑ "Schalit reunites with parents, PM... JPost – Diplomacy & Politics". Jpost.com. October 18, 2011. Archived from the original on December 22, 2011. Retrieved May 6, 2012. ↑ "NTC claims capture of Gaddafi – Africa". Al Jazeera English. 2011-10-04. Retrieved 2011-10-20. ↑ "BBC News – Col Gaddafi killed". BBC. October 22, 2011. Retrieved 2011-10-20. ↑ Nakhoul, Samia (October 20, 2011). "Gaddafi dies of wounds – NTC official". Reuters UK. Reuters. Retrieved 2011-10-20. ↑ "Muammar Gaddafi 'killed' in gun battle – Africa". Al Jazeera English. 2011-10-04. Retrieved 2011-10-20. ↑ "ETA pone fin a 43 años de terror | Política &#124". El País. Politica.elpais.com. Retrieved 2012-05-06. ↑ "2011 Van earthquake". Earthquake Report. 2011-10-23. Retrieved 2012-05-06. ↑ "Leaders agree eurozone debt deal after late-night talks". BBC News. 27 October 2011. Retrieved 27 October 2011. ↑ Bhatti, Jabeen (27 October 2011). "EU leaders reach a deal to tackle debt crisis". USA Today. Retrieved 27 October 2011. ↑ "Population seven billion: UN sets out challenges". BBC News. 2011-10-26. Retrieved 2011-10-30. ↑ "General Conference admits Palestine as UNESCO Member". 2011-10-31. Retrieved 2011-12-11. ↑ Dunn, Marcia (November 26, 2011). "NASA launches world's largest rover to Mars". The Globe and Mail. Cape Canaveral, Florida. The Associated Press. Archived from the original on January 7, 2012. Retrieved August 23, 2017. ↑ Klotz, Irene (27 November 2011). "NASA rover launched to seek out life clues on Mars". Cape Canaveral, Florida. Reuters. ↑ "NASA launches new Mars rover". Al Jazeera. 26 November 2011. ↑ James Reynolds (9 November 2011). "UK to expel all Iranian diplomats over embassy attack". BBC. Retrieved 1 December 2011. ↑ "US flag ceremony ends Iraq operation". BBC News. December 15, 2011. Retrieved 15 December 2011. ↑ Easley, Jonathan (December 15, 2011). "Panetta marks Iraq war's end in Baghdad". DEFCON Hill – The HILL’S Defense Blog. Retrieved 15 December 2011. ↑ "US lowers flag to end Iraq war". Associated Press. December 15, 2011. Retrieved 15 December 2011. ↑ "U.S. formally ends Iraq war with little fanfare". Associated Press. December 15, 2011. Retrieved 15 December 2011. ↑ Mak, Tim (December 15, 2011). "Leon Panetta marks end of Iraq war". POLITICO.com. Retrieved 15 December 2011. ↑ "Effects of Tropical Storm "Sendong" (Washi) and Emergency Operations" (PDF). Philippines: National Disaster Risk Reduction and Management Council. 30 December 2011. Archived from the original (PDF) on May 2, 2012. Retrieved 1 January 2012. ↑ "The Nobel Prize in Chemistry 2011". Nobel Foundation. 2011-10-05. Retrieved 2011-10-05. ↑ "The Nobel Prize in Economics 2011". Nobel Foundation. Retrieved 2011-10-20. ↑ "The Nobel Prize in Literature 2011". Nobel Foundation. 2011-10-06. Retrieved 2011-10-06. ↑ "The Nobel Peace Prize 2011". Nobel Foundation. 2011-10-07. Retrieved 2011-10-07. ↑ "The 2011 Nobel Prize in Physics – Press Release". Nobelprize.org. 2011-10-04. Retrieved 2012-05-06. ↑ "The Nobel Prize in Physiology or Medicine 2011". Nobelprize.org. Retrieved 2012-05-06. ↑ "Time Traveler by Merriam-Webster: Words from 2011". merriam-webster.com. Retrieved May 4, 2018.